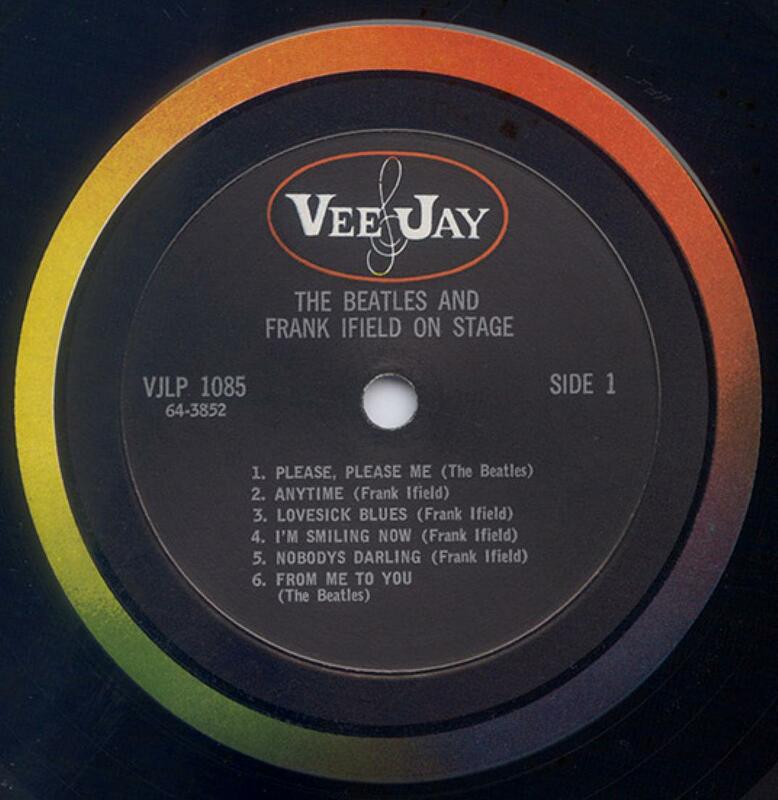 Introducing The Beatles, Vee-Jay VJLP 1062, Cover Variations (Version Two). 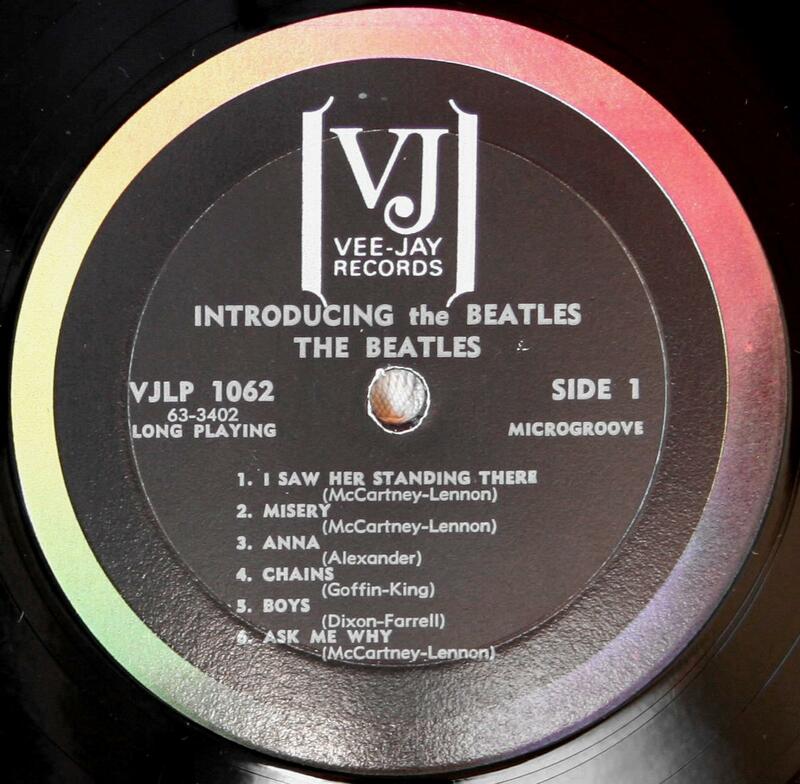 Introducing The Beatles Vee-Jay VJLP-1062, Version 2, February 10, 1964. 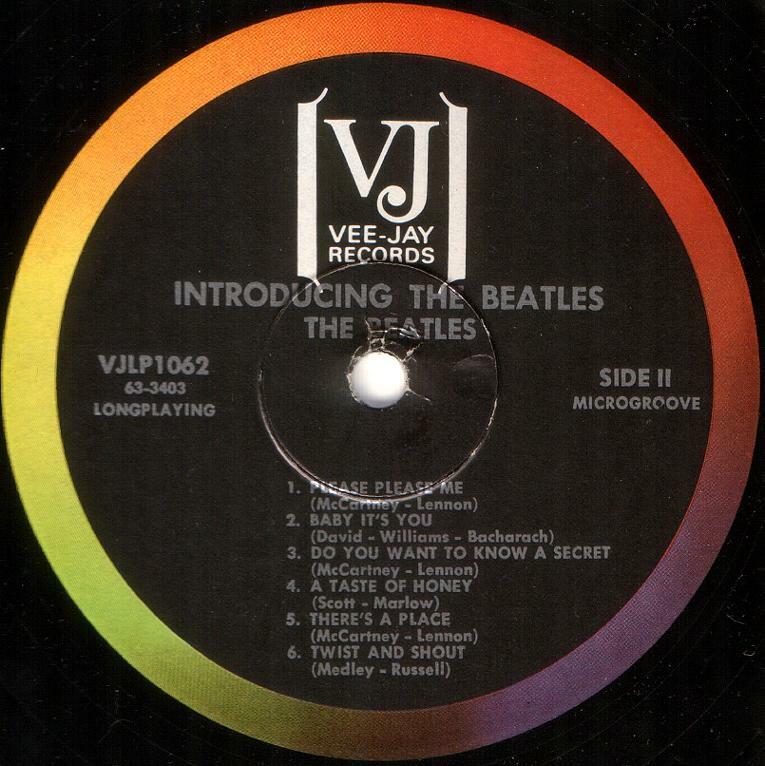 One of the three Beatles-related lowsuits involving Vee-Jay in January of 1964 involved the copyrights to two of the songs featured on Introducing The Beatles, namely Love Me Do and P.S. I Love You. 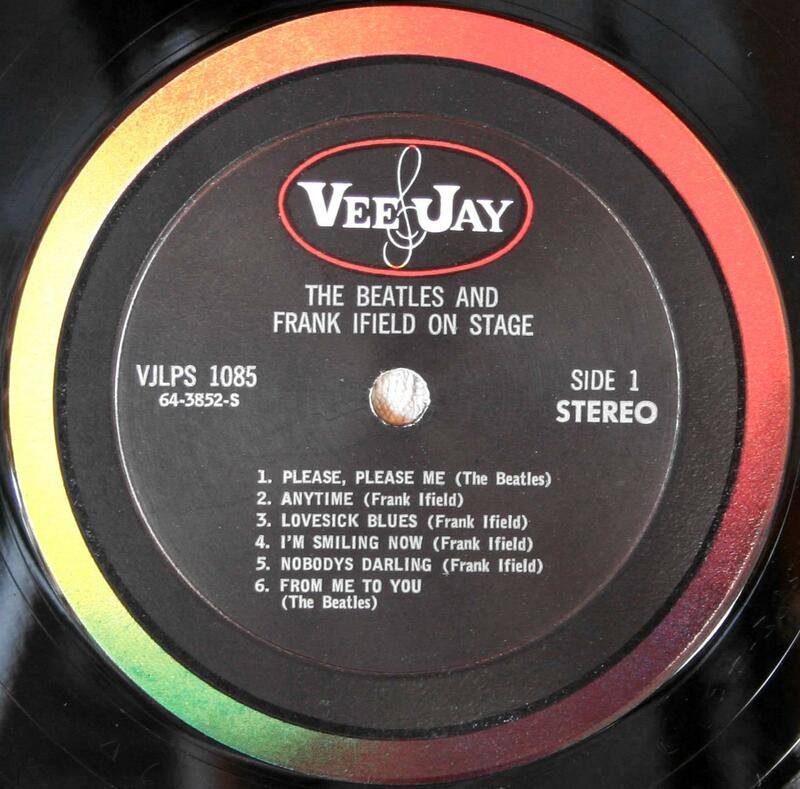 In Beechwood Music, Inc. vs Vee-Jay Records, Inc., the New York federal District Court issued an injunction prohibiting Vee-Jay from producing or distributing any records containing the songs Love Me Do and P.S. I Love You. 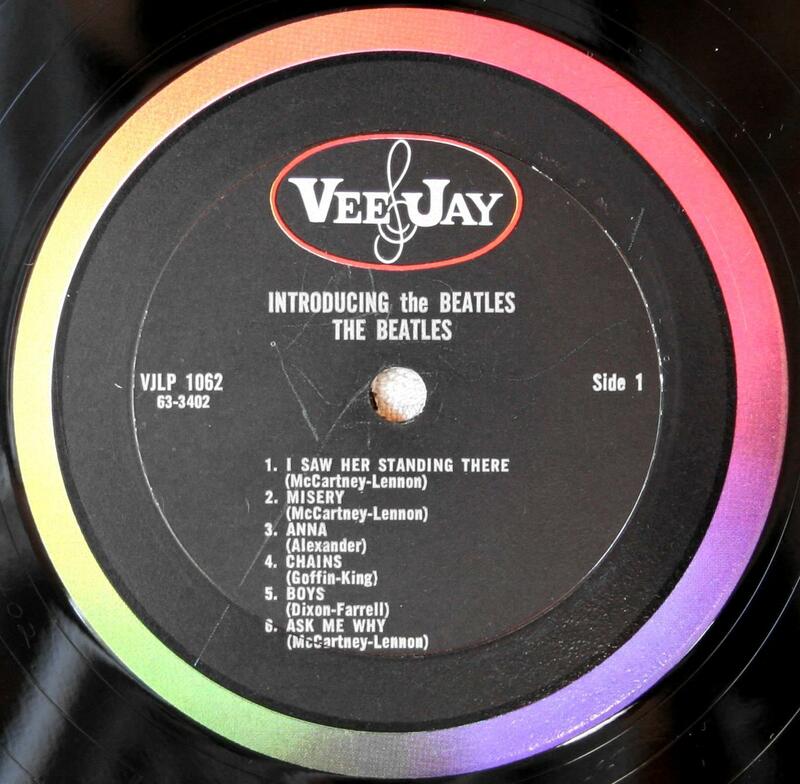 Although Vee-Jay appealed this decision, the company decided that it could eliminate its immediate problem with its Introducing The Beatles album by dropping the two songs from the album. These songs were replaced with Ask Me Why and Please Please Me. 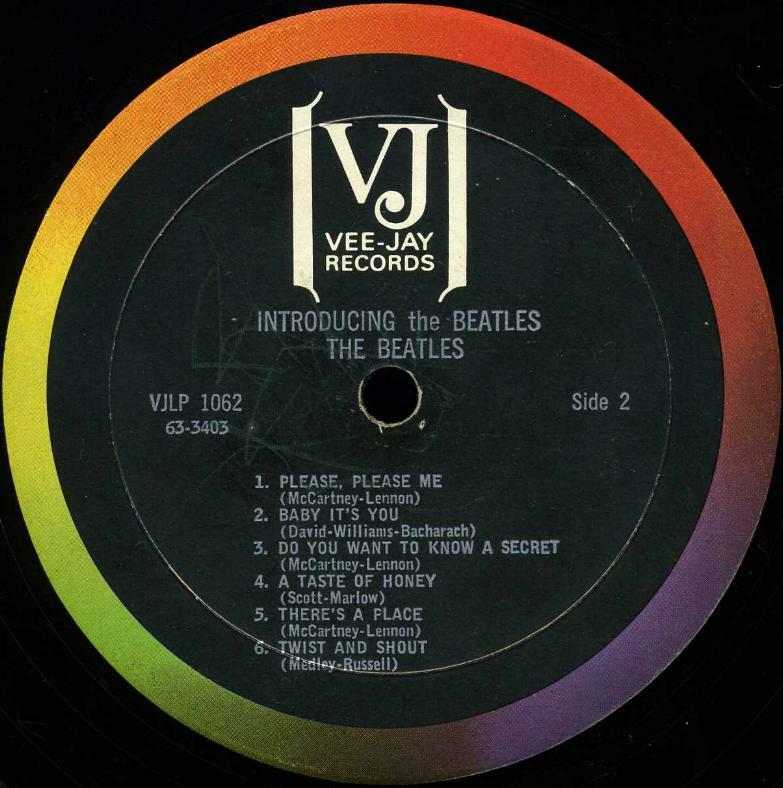 Vee-Jay prepared new covers for the revamped album, which is sometimes referred to as the “Please Please Me” version or the “Ask Me Why” version. The front cover of the album is the same as the Version One cover without “Printed In U.S.A.”. The back cover is identical to the Titles On Back variation of Version One, except for the substitution of the titles of replacement songs. 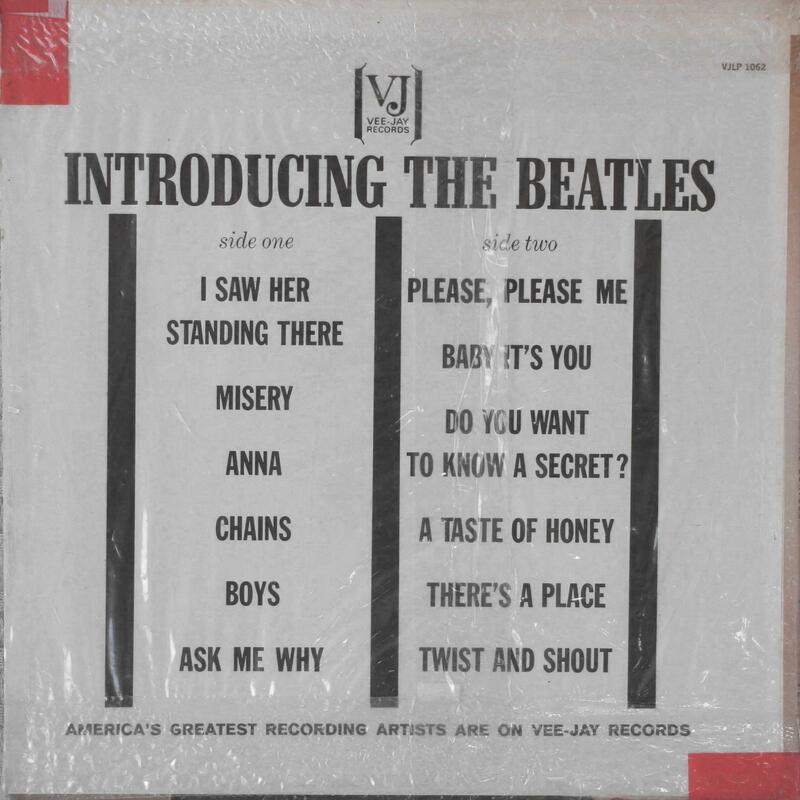 The standard mono cover for Version Two is the most common of all Introdusing The Beatles covers. 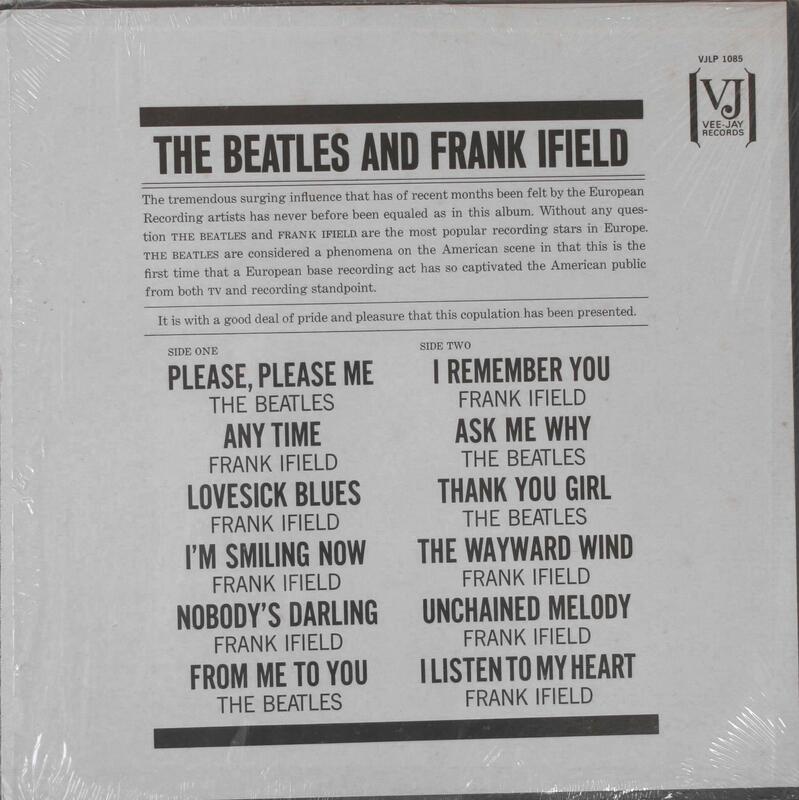 There are two slight variations of the back cover: lists “PLEASE PLEASE ME” without a comma and lists “PLEASE, PLEASE ME” with a comma. 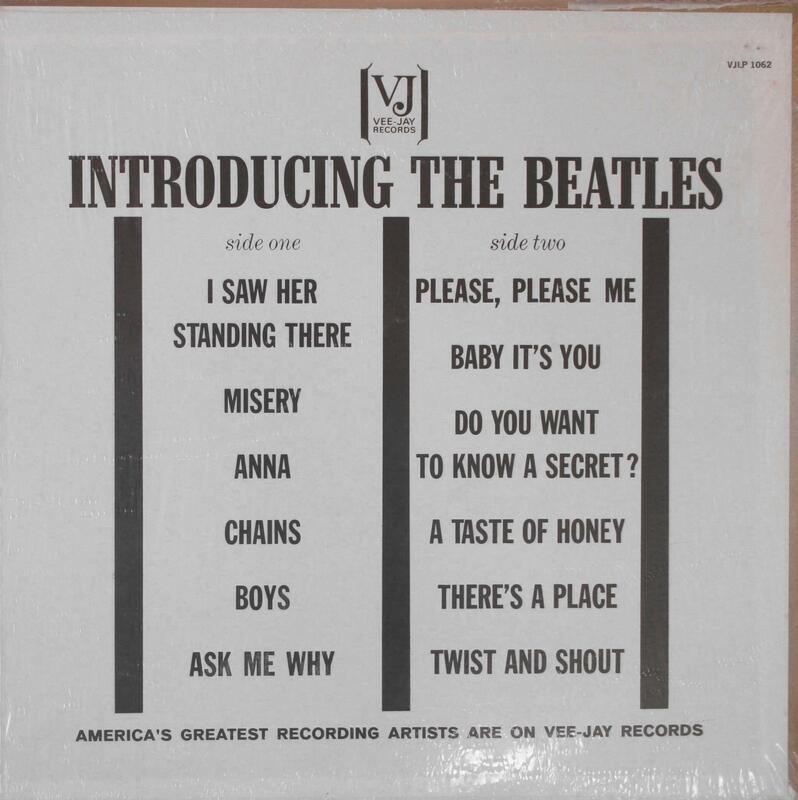 The Version Two stereo cover is essentially the same as the Titles On Back Version One stereo cover without “Printed In U.S.A.”, except for the substitution of the titles of replacement songs. The cover has a white top banner with “STEREOPHONIC” centered in grey and the number SR 1062 in black in the upper right hand corner. 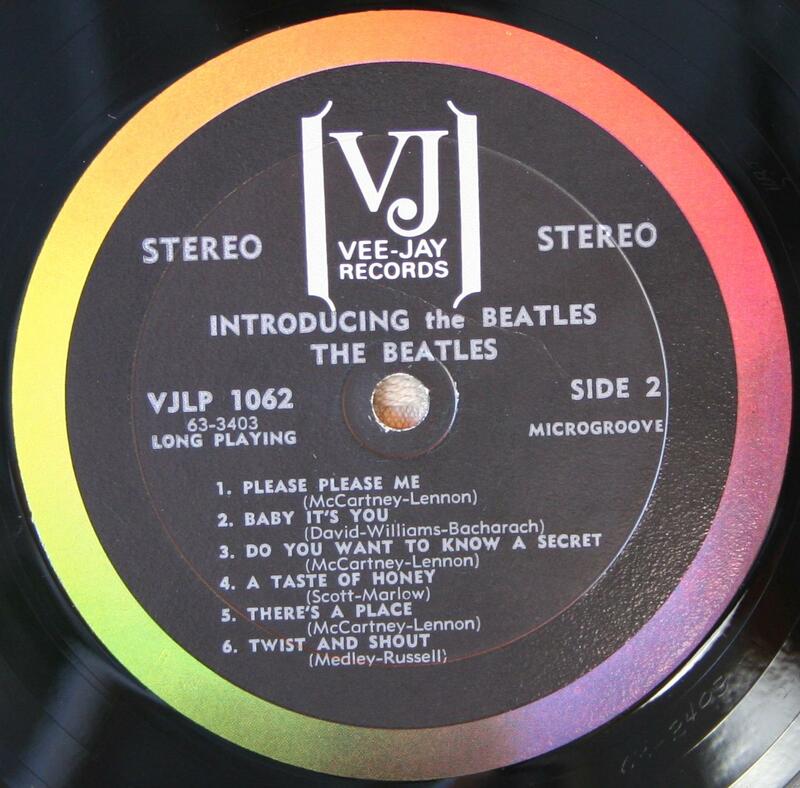 There are one variation of the back cover, lists “PLEASE, PLEASE ME” with a comma. 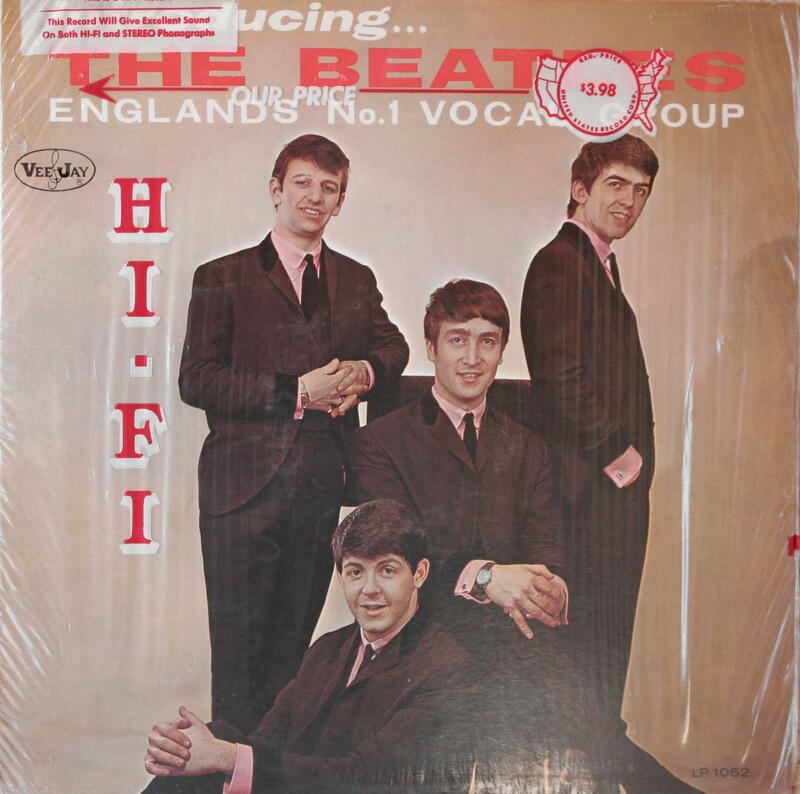 Introducing The Beatles, Vee-Jay VJLP 1062, Mono Record Variations (Version Two). 1. Black label with an outer rim colorband featuring an oval logo. There are two verified typesetting variations of this record. 1.1. 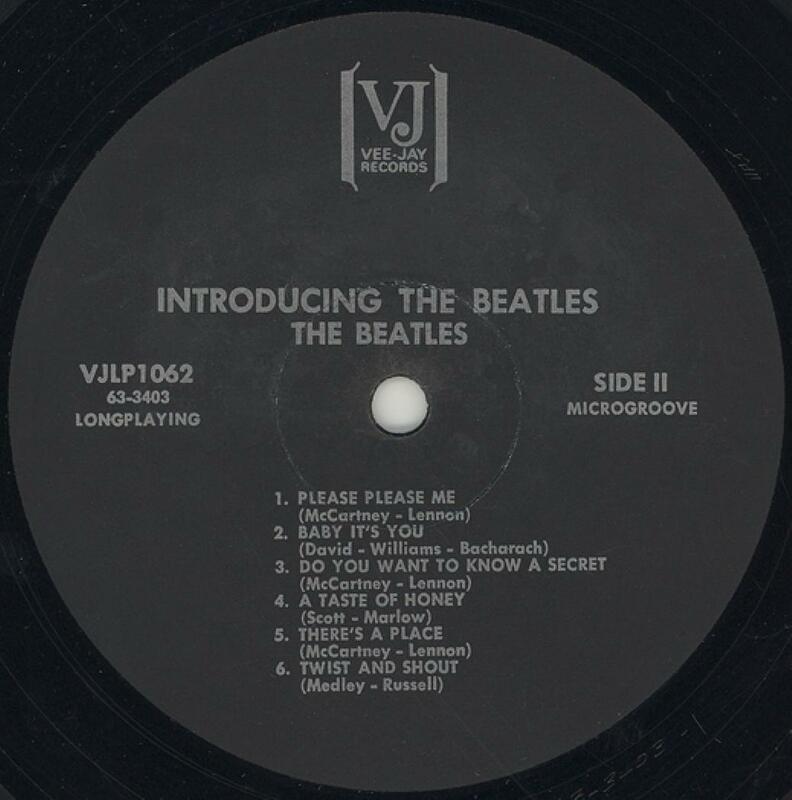 First record variation has left justified song titles and songwriters’ credit in small type with medium type “INTRODUCING THE BEATLES” and “SIDE I” and “SIDE II” and small type “LONGPLAYING” and “MICROGROOVE” on the label. This variation has a humorous typo in the songwriters’ credit for Chains, which was written by Gerry Goffin and Carole King. The label credits the to “Goffin-King”. The record’s trail off areas include the following hand etched markings: “URJ”, “AL” the date 2-6-64 and the matrix followed by “-1”. The machine stamped Audio Matrix logo also appears. This thick vinyl pressing was manufactured by Southern Plastics. 1.2. 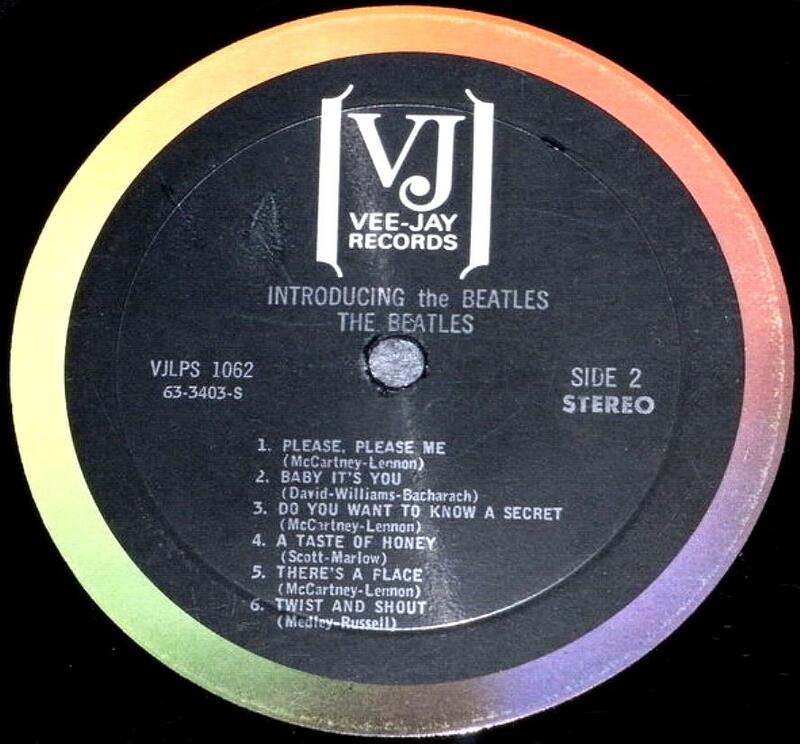 Second record variation has left justified titles and credits, “Side 1” and “Side 2” and “INTRODUCING the BEATLES”, all in small print on the label. The words “Long Playing” and “Microgroove” do not appear on the label. There are at least two trail off area variations: “URJ” and matrix numbers hand etched an both sides and “URJ” and the matrix number 63-3402-2 on Side 1 and “URJ” and the matrix number 63-3403-3 on Side 2. This variation has characteristics similar to albums pressed by Columbia Records in Bridgeport. 2. Black label backdrops featuring the outer rim colorband and brackets logo. The following typesetting variations of this label. 2.1. 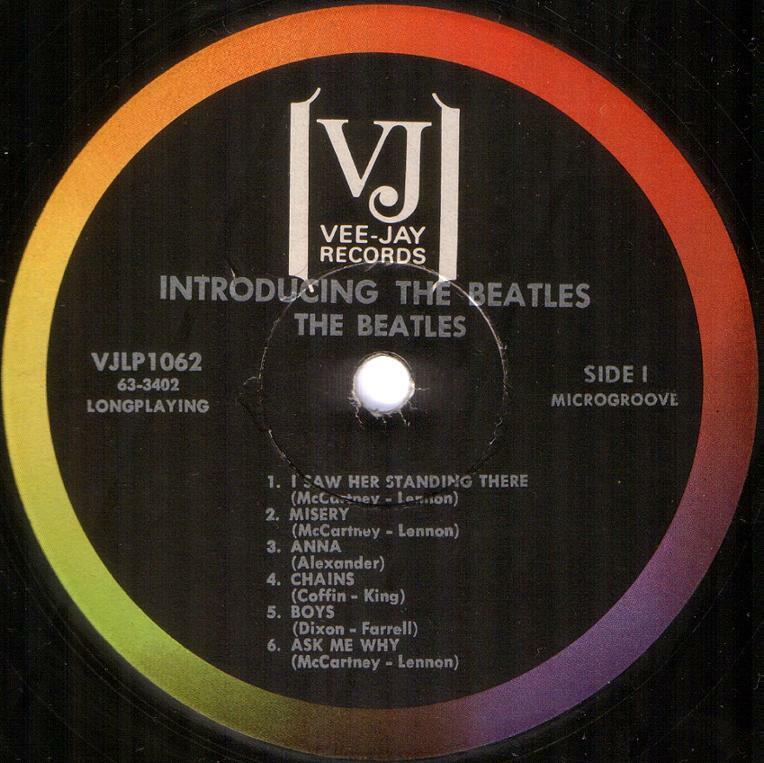 First record variation has centered titles and credits with “INTRODUCING THE BEATLES”, “Long Playing” and “Microgroove” on the label. It also has the “Coffin-King” typo. Its trail off areas contain hand etched matrix numbers, “URJ” and the date 2-6-64 along with Audio Matrix and ARP logos. This record was manufactured by ARP. 2.2. Second record variation has left justified song titles and songwriter’s credits and with “INTRODUCING the BEATLES” in small print on the label. The words “Longplaying” and “Microgroove” do not appear on the label. The trail off areas have the hand etched matrix number 63-3402 and job number 6307 on Side 1 and matrix number 63-6403 and job number 6307X on Side 2. Both sides have the MR logo, indicating that this record was pressed by Monarch Records. 2.3. 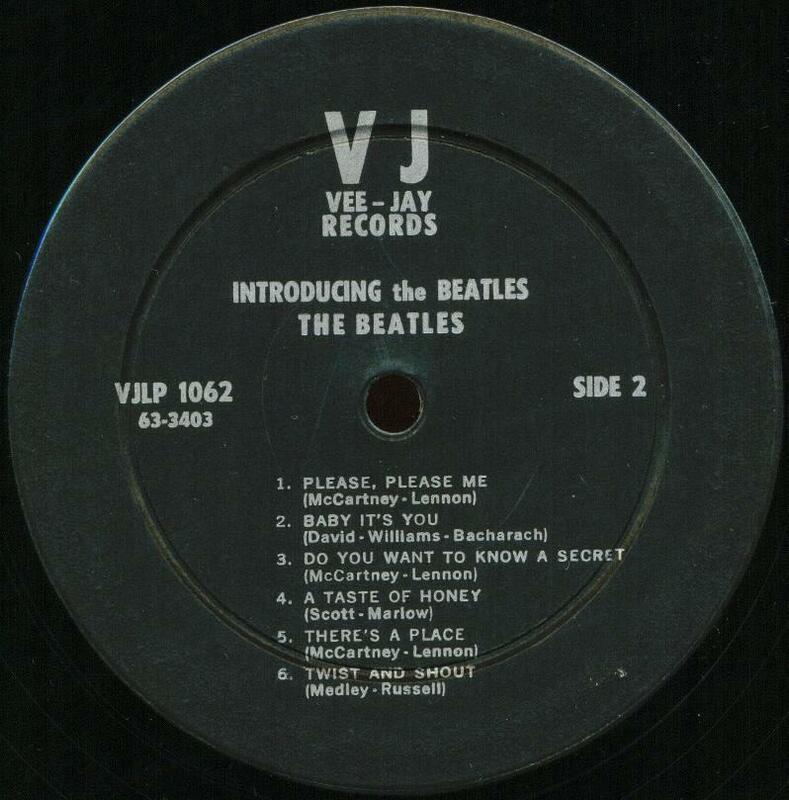 Third record variation has the same typesetting as second label variation, having left justified song titles and credits, including the “Coffin-King” typo, with “INTRODUCING THE BEATLES” and “LONGPLAYING” on the label. SIDE I and SIDE II variation. The record’s trail off areas include the following hand etched markings: “URJ”, “AL” the date 2-6-64 and the matrix followed by “-1”. The machine stamped Audio Matrix logo also appears. This thick vinyl pressing was manufactured by Southern Plastics. 2.4. 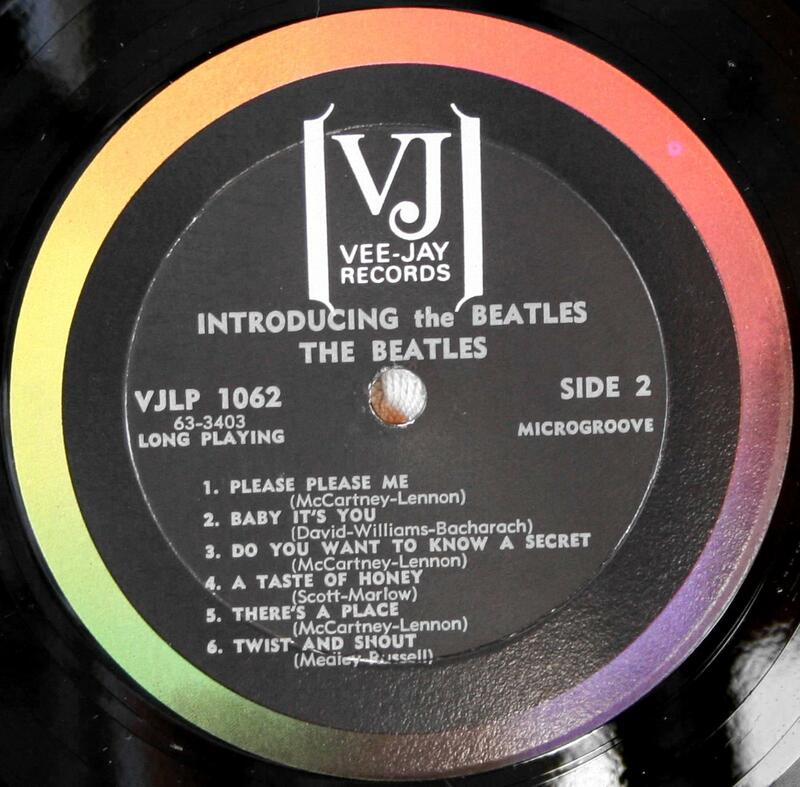 Fourth record variation has left justified song titles and indented credits with “INTRODUCING the BEATLES”, “LONGPLAYING” or “LONG PLAYING” (two words) on the label. The trail off areas to these record have hand etched matrix numbers and “URJ” and “ARC” along with the machine stamped Audio Matrix logo. On some discs the date 2-11-64 appears. These records were pressed by ARC. 2.5. 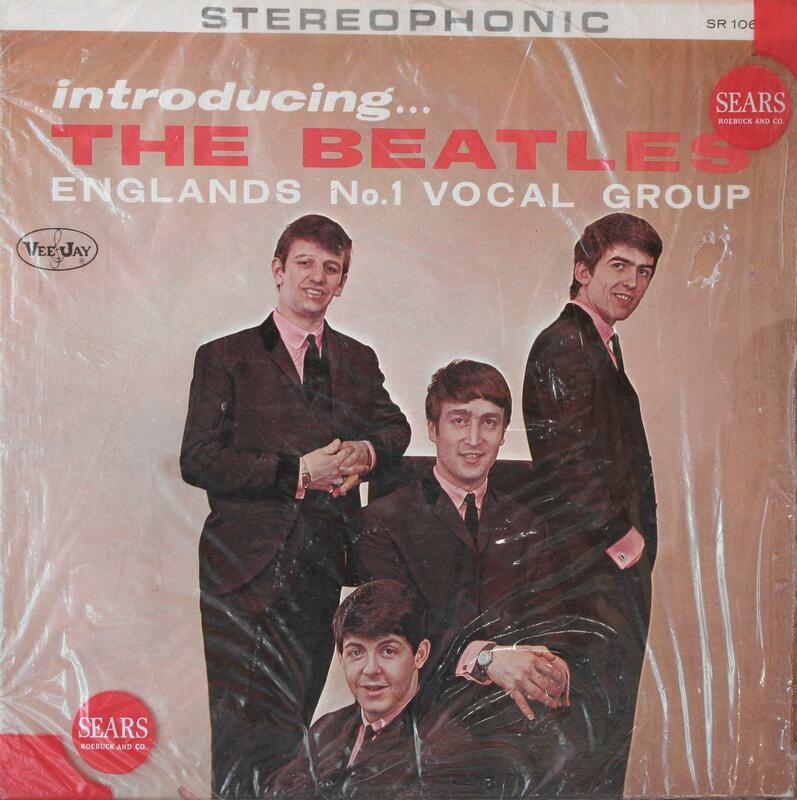 Fifth record variation has left justified titles and creditswith “INTRODUCING the BEATLES” and without “Long Playing” and “Microgroove” on the label. Its trail off area with the matrix number 63-3402 and the job number 6307 on SIDE 1 and the matrix number 63-3403 and the job number 6307X on SIDE 2. Both sides have the machine stamped MR logo; however, it is scratched over so that it cannot be read. This record was pressed with a stamper previously used by Monarch Records and then send to another factory, possibly H.V. Waddell Co. in Burbank, California. 2.6. Sixth record variation were pressed with 45-size labels. 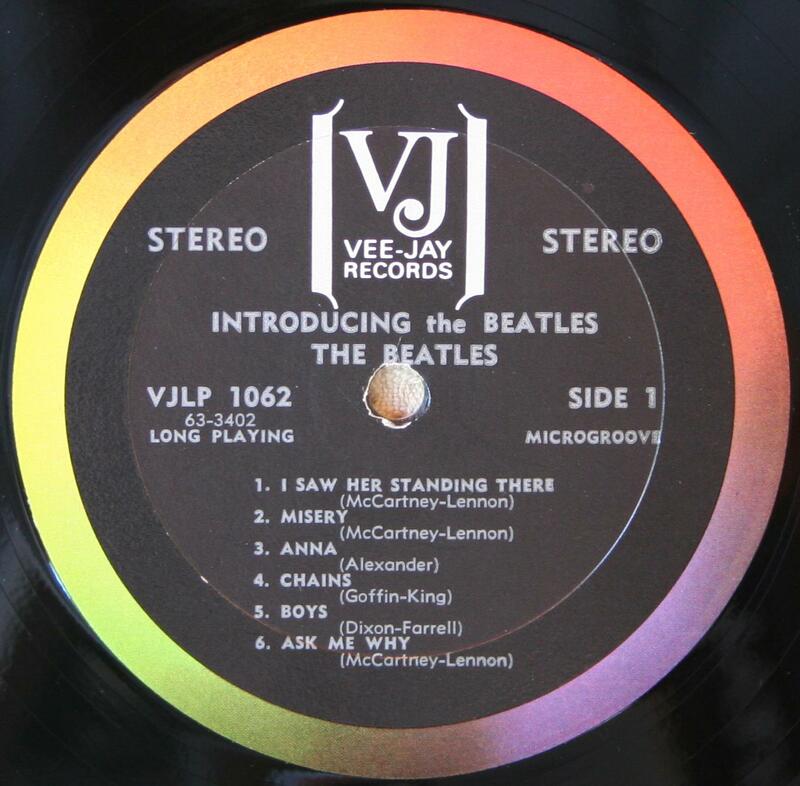 This record has centered titles and credits with “INTRODUCING THE BEATLES”, “Long Playing” and “Microgroove” on the label, along with the “Coffin-King” typo; however, it is printed on a black label with an outer rim colorband featuring a small brackets logo on a 45-size label. This record was manufactured by ARP. 3. All black label (without the outer rim colorband) with silver print. 3.1. First record variation has all black label with silver print and “VJ” in large block letters with “VEE JAY RECORDS” printed below. Is has left justified titles and credits with “INTRODUCING the BEATLES” and does not have the words “Long Playing” and “Microgroove” on the label. There are two confirmed typesetting variations. With the word “SIDE” in uppercase and thin microprint song titles. On some copies, the trail off areas have a hand etched matrix number and no other markings. Other copies have additional markings on SIDE 2 only, specifically the job number 6307X and a scratched-over MR logo, indicating a stamper previously used by Monarch Records. Or the word “Side” in upper and lower case and has its song titles in thick medium print. Its trail off areas contain hand etched matrix numbers and job numbers and scratched over MR logo. This record may have been pressed by Columbia Records in Terre Haute, Indiana. 3.2. 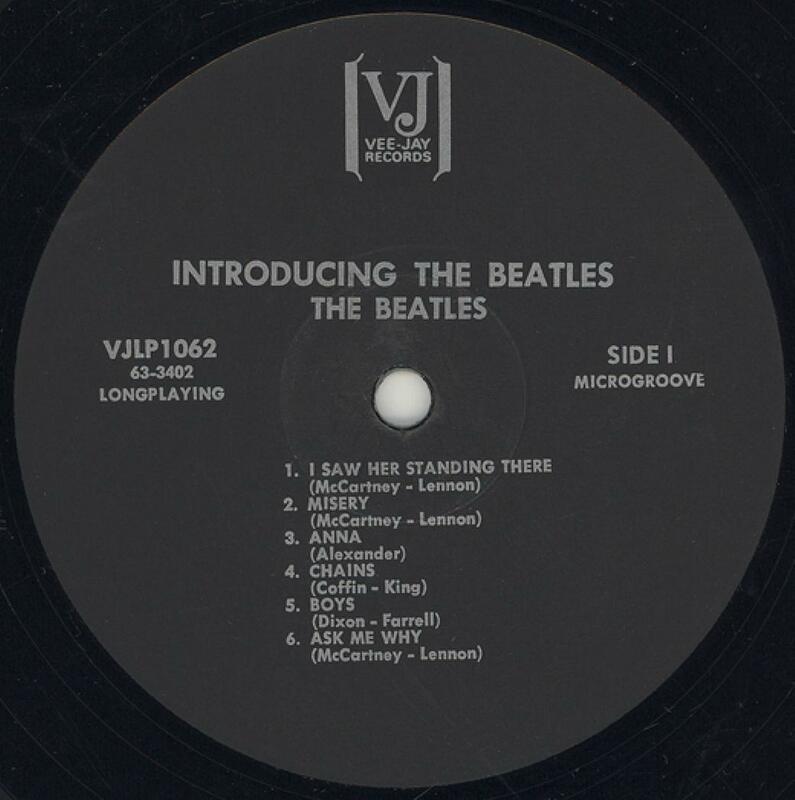 Second record variation has all black label with silver print featuring an oval logo, with left justified titles and credits, “Side 1” and “Side 2” and “INTRODUCING the BEATLES”, all in small print. Its trail off areas include the matrix number followed by “-4”, indicating that this is a later pressing of the record. This record was possibly pressed by Columbia Records in Bridgeport. This pressing is one of the rarer variations of the album. 3.3. 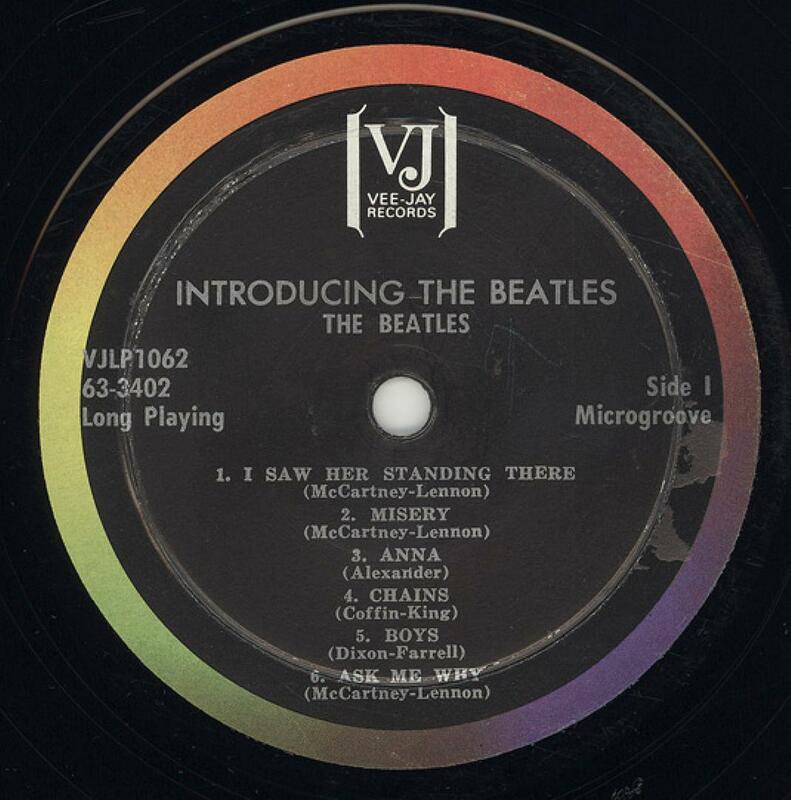 Third record variation has all black label with silver print featuring the small brackets logo with left justified song titles and credits, including the “Coffin-King” typo, with “INTRODUCING THE BEATLES”, “LONGPLAYING” and “MICROGROOVE”. The record’s trail off areas include the following hand etched markings: “URJ”, “AL” the date 2-6-64 and the matrix followed by “-1”. The machine stamped Audio Matrix logo also appears. This thick vinyl pressing was manufactured by Southern Plastics. Introducing The Beatles, Vee-Jay VJLP 1062, Stereo Record Variations (Version Two). 1. Black label with an outer rim colorband featuring an oval logo. Warning: None of the dealers or collectors not confirm the existence of any stereo Version Two records with a full-size oval logo. But Vee-Jay use of 45-size labels even occurred with some stereo records. 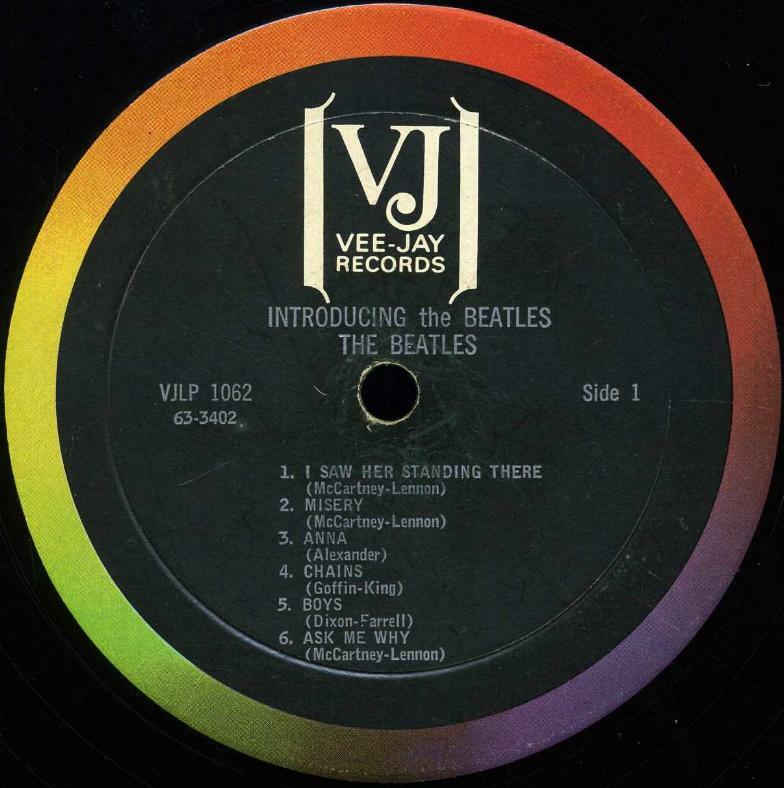 This record has “INTRODUSING the BEATLES” and left justified titles and credits printed on a 45-size black label with an outer rim colorband and small oval logo. The word “STEREO” is at 3 o’clock. The words “Microgroove” and “Long Playing” are not on the label. The trail off area to the Side 1 has the hand etched initials “URJ”, the matrix number 63-3402-S and the job number 6313. The trail off area to the Side 2 has the hand etched initials “URJ”, the matrix number 63-3403-S and job number 6313X. Both sides have the machine stamped MR logo. This record was pressed by Monarch Records. 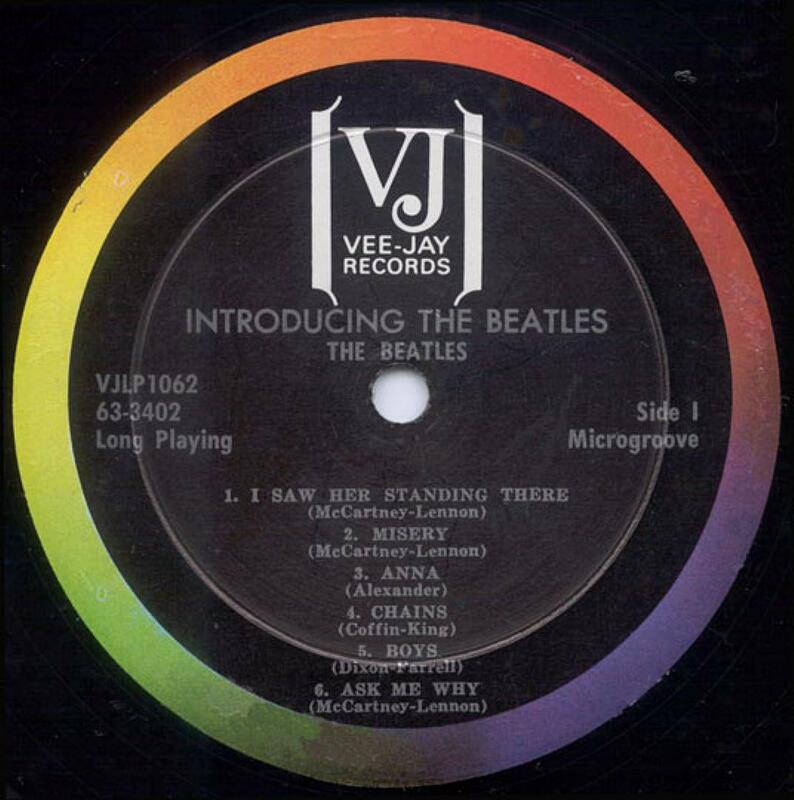 First record variation has centered titles and credits with “INTRODUCING THE BEATLES”, “Long Playing” and “Microgroove” on the label. It also has the “Coffin-King” typo. “STEREO” appears at 12 o’clock. Its trail off areas contain hand etched matrix numbers, “URJ” and the date 1-24-64 on both sides and matrix number S 63-3402-1 on Side I and S 63-3403-1 on Side II. The machine stamped Audio Matrix and ARP logos also appears on both sides. This record was manufactured by ARP. 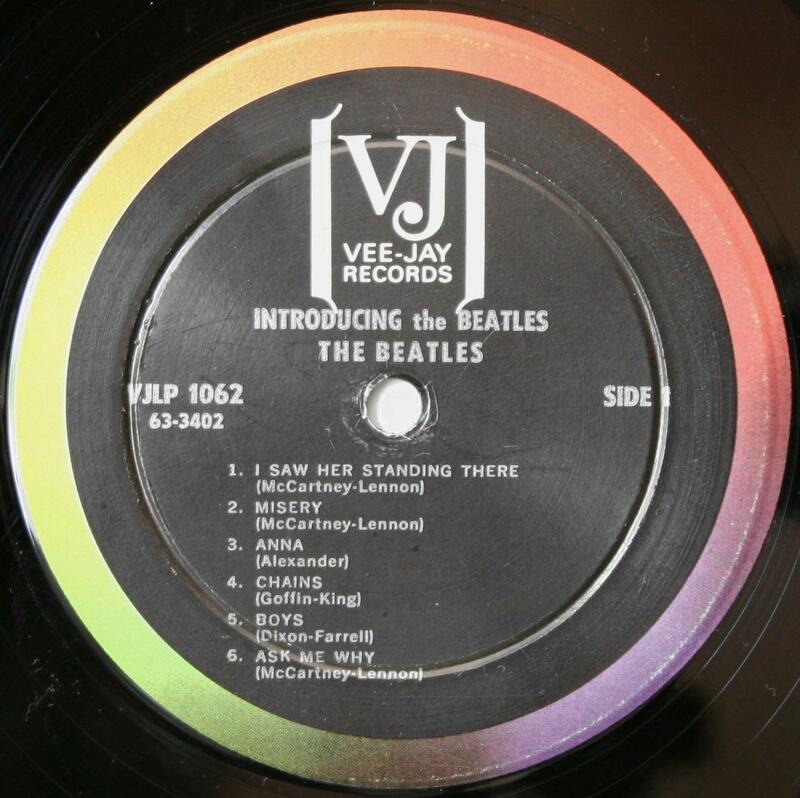 Second record variation has left justified song titles and songwriter’s credits and with “INTRODUCING the BEATLES” in small print on the label. The words “Longplaying” and “Microgroove” do not appear on the label. “STEREO” at 3 o’clock in either: medium print with “Side” in upper and lower case; or small print with either: “Side” in upper and lower case; or “SIDE” in upper case. To add to the confusion, some records have “Side 1” in upper and lower case and “SIDE 2” in upper case while other have “SIDE 1” in upper caseand “Side 2” in upper and lower case. All vriations have the hand etched initials “URJ” on both sides and matrix number S 63-3402-S and job number 6313 on Side 1 and the matrix number S 63-3403-S and job number 6313X on Side 2. The MR logo on both sides. These records were pressed by Monarch Records. 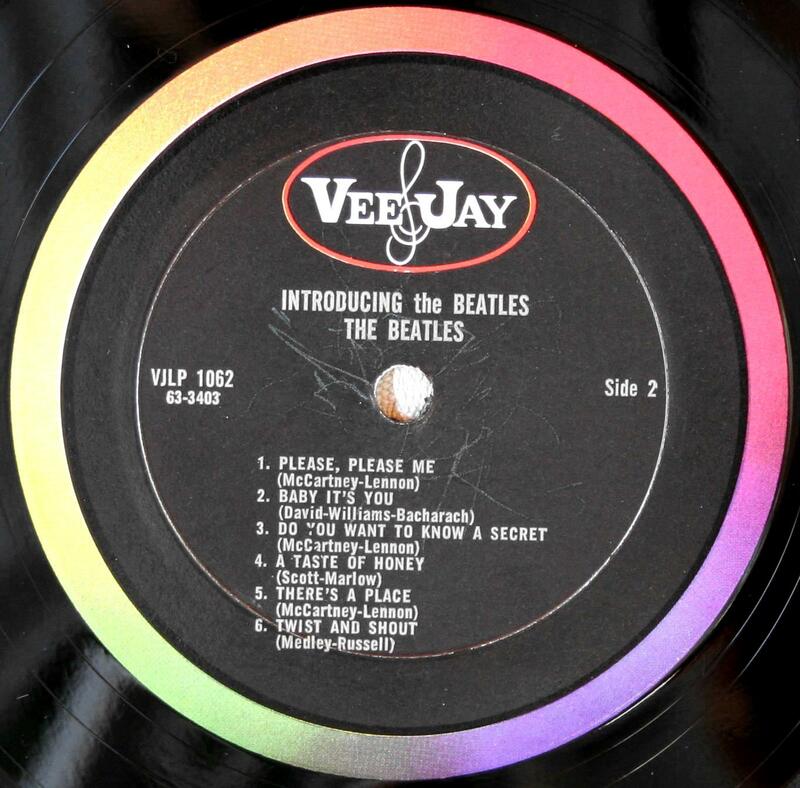 Third record variation has left justified song titles and indented credits with “INTRODUCING the BEATLES” and “LONG PLAYING” on the label. The word “STEREO” appears on each side of the brackets logo. The trail off areas include the matrix numbers S 63-3402 on SIDE 1 and S 63-3403 on SIDE 2. Each side also includes the hand etched date 2-6-64, “URJ” and the letters “ARC” as well as the machine stamped Audio Matrix logo. This record was pressed by ARC. 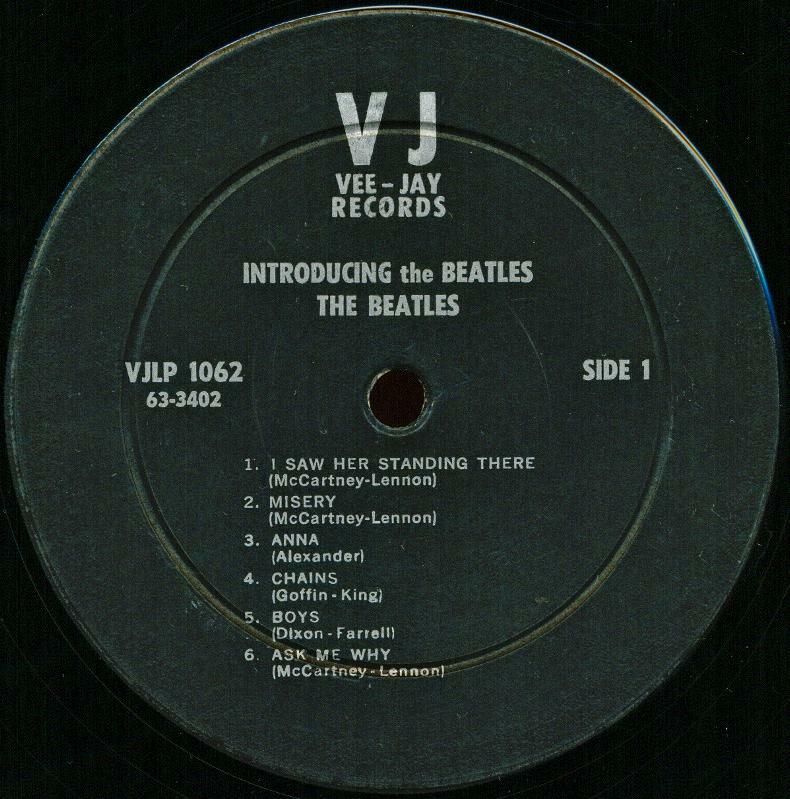 This record variation has all black label with silver print and “VJ” in large block letters with “VEE JAY RECORDS” printed below. Is has left justified titles and credits with “INTRODUCING the BEATLES” and does not have the words “Long Playing” and “Microgroove” on the label. “STEREO” at 9 o’clock. There are two confirmed typesetting variations. With the word “STEREO” in thick print and “STEREO” in tall, thin print. The trail off areas are identical for both variations. These trail off areas have the hand ectched matrix number S 63-3402-STEREO and job number 6313 on SIDE 1 and matrix number S 63-3403-STEREO and job number 6313X on SIDE 2, “URJ” and MR logo apper on both sides. Although the MR logo is not scratched out, the characteristics of this records, particularly the deep circular indentation located 5/8″ inside the outer border of the label, are more similar to discs made by Monarch. But these variations were possibly pressed by Columbia Records in Terre Haute, Indiana with stampers previously used by Monarch. Jolly What! 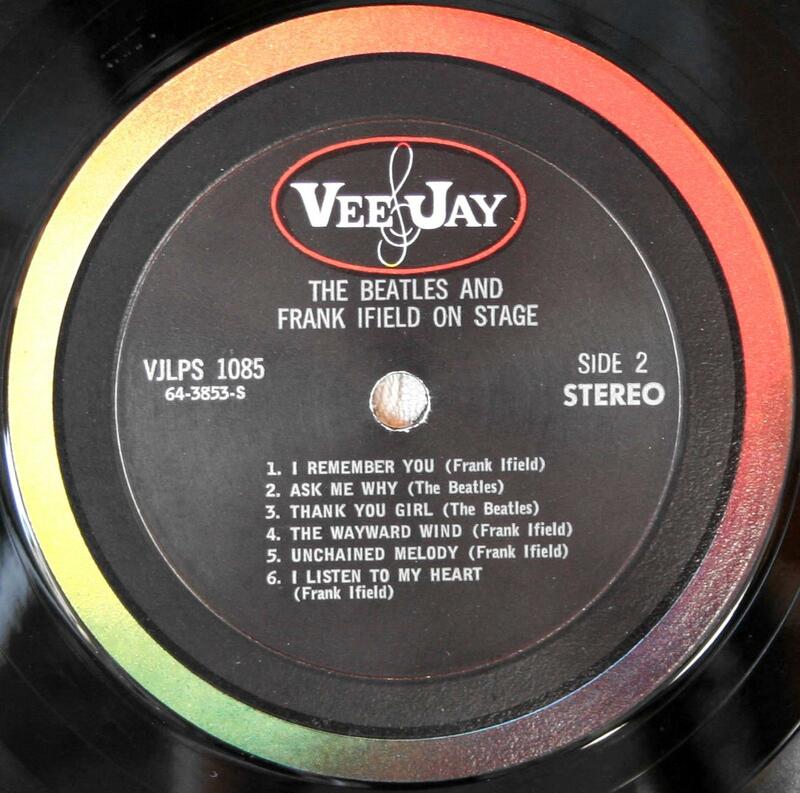 The Beatles & Frank Ifield On Stage, Vee-Jay VJLP(S) 1085. Jolly What! 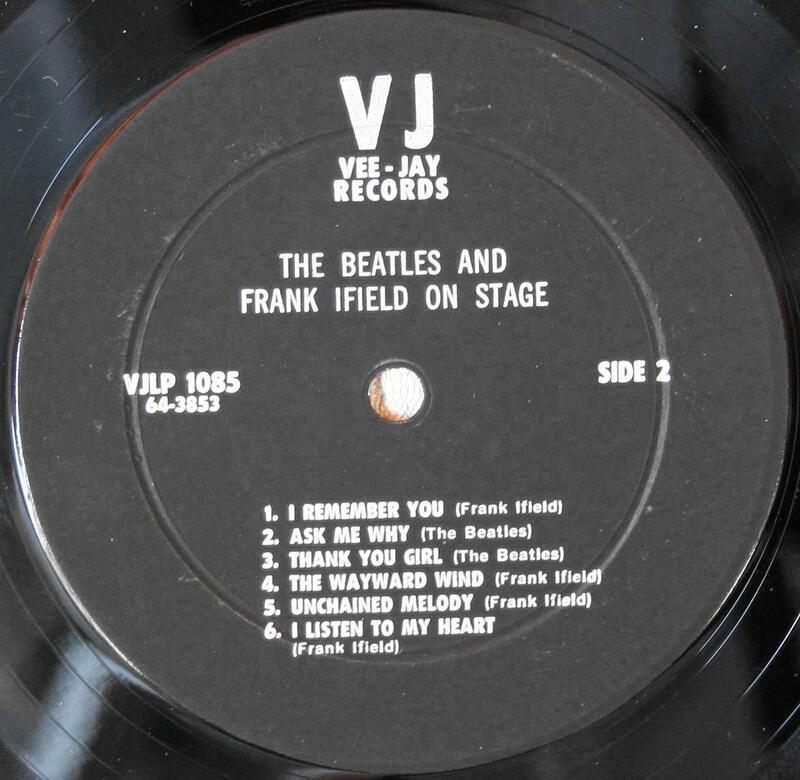 The Beatles & Frank Ifield On Stage, Vee-Jay VJLP(S) 1085, Fabruary, 1964. The cover features a drawing of a mastached English statesman holding a pair of spectacles. 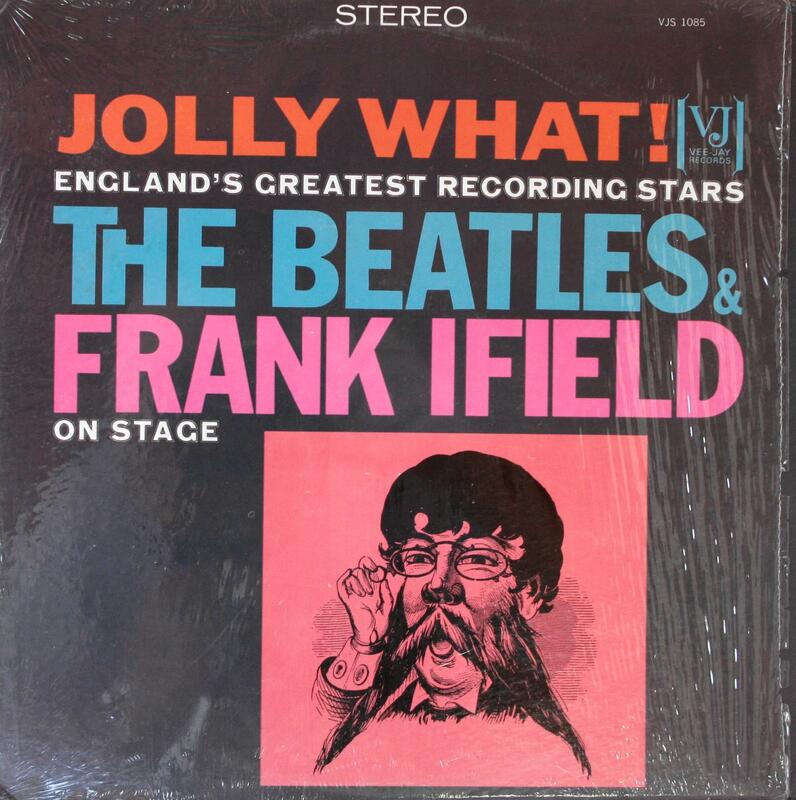 The front jacket proudly bills the Beatles and Frank Ifield as England’s greatest recording stars, must be viewed as either a total lie or a gross distortion since all 12 songs on the album are studio recordings, not live version of the songs as the title implies. The back of the Jolly What! 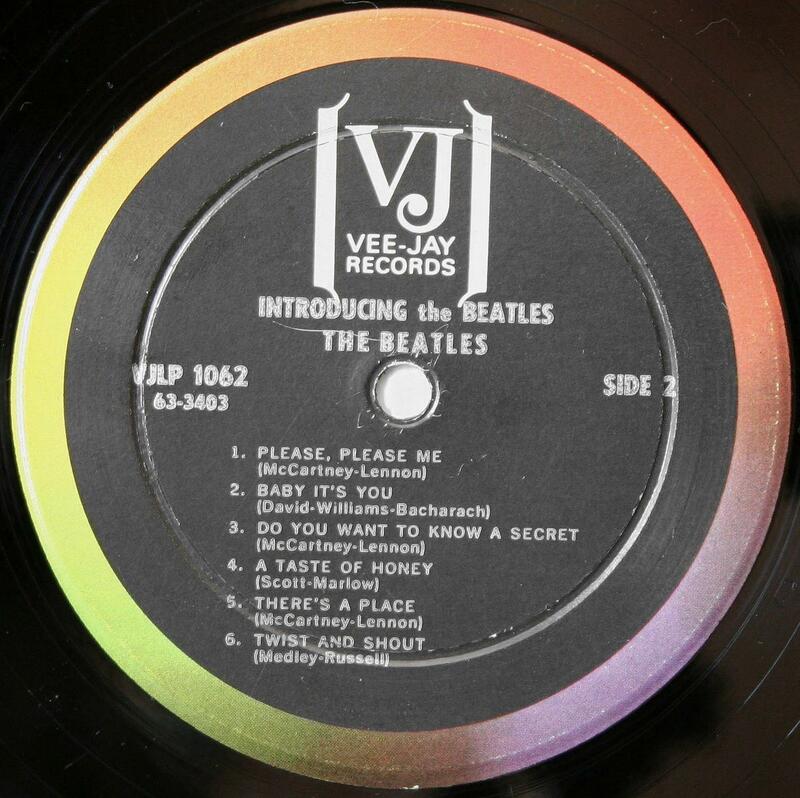 album jacket reveals the inclusion of only four Beatles songs: Please Please Me, From Me To You, Ask Me Why and Thank You Girl. 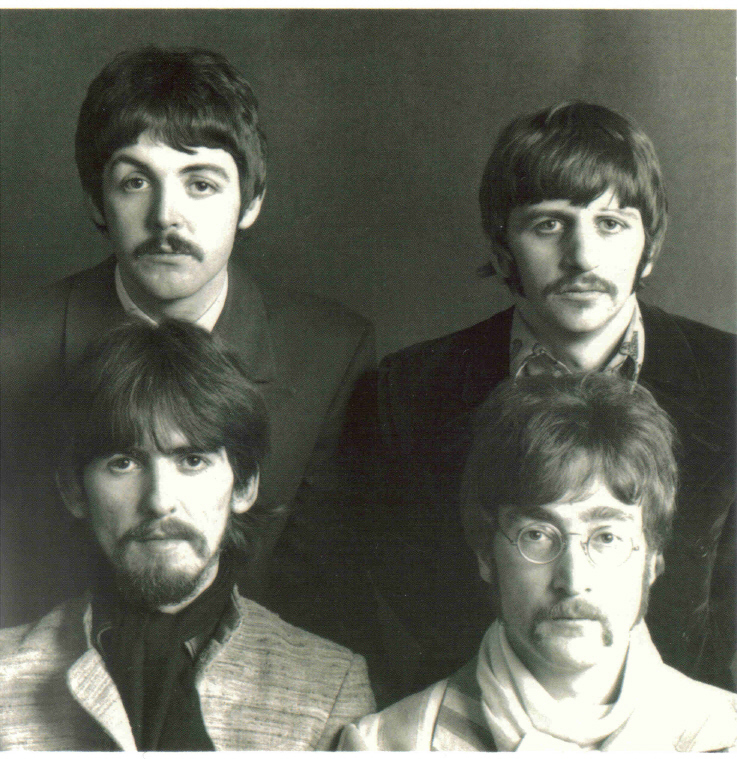 These were the song that appeared on VJ 498 and VJ 522, the first two Beatles singles released in the United States. 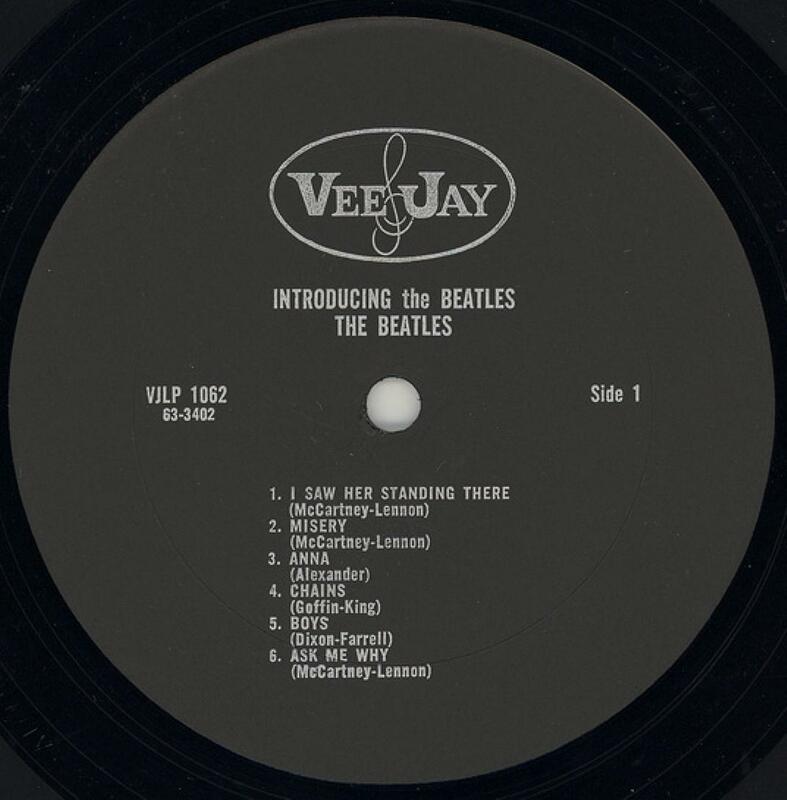 The text on the back cover of the album was apparently written by Muriel Gaynor, a Vee-Jay employee who handled production matters and assisted Jay Lasker. 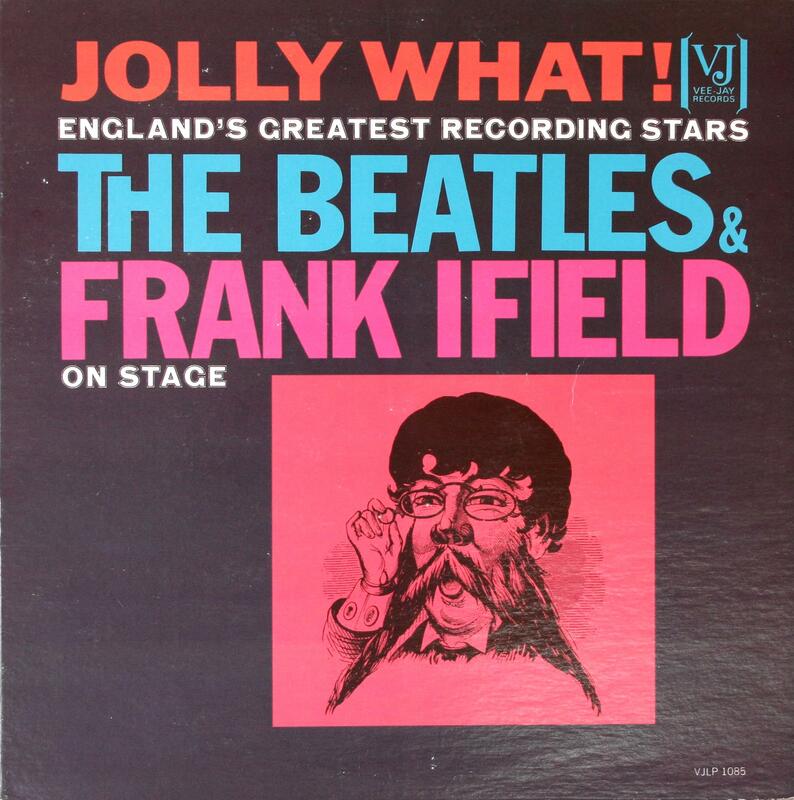 All of the Frank Ifield songs on the album are in true stereo as are Please Please Me and Ask Me Why. 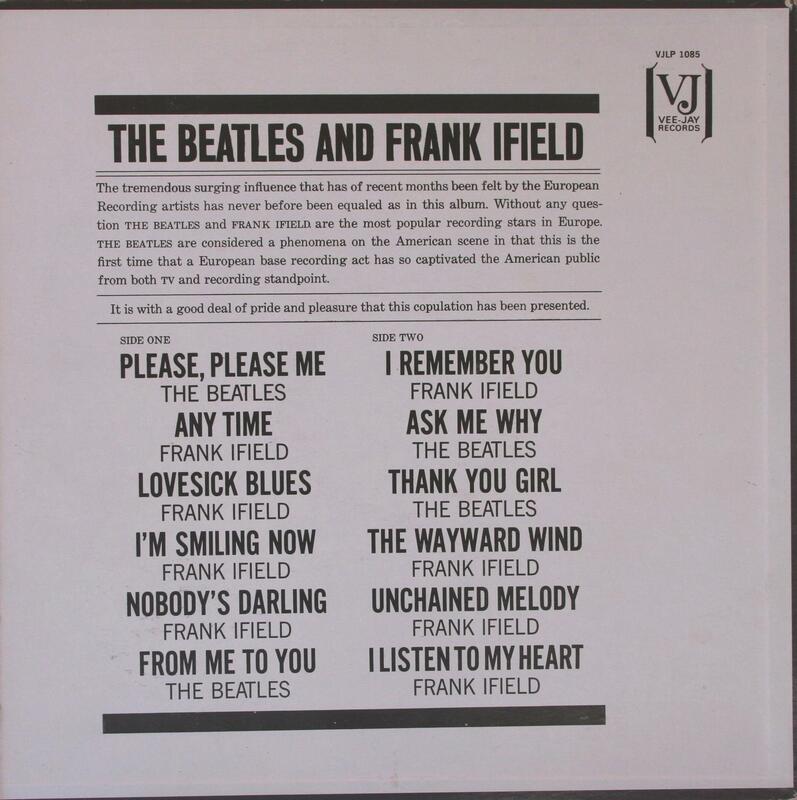 As From Me To You and Thank You Girl were not included on the group’s first Parlophone album, Vee-Jay never obtained stereo masters for these songs and they appear in mono. The album’s mono jacket has the cover slick positioned so that the number VJLP 1085. For the stereo jacket the word “STEREO” appears at the top center of the cover and the number VJS 1085 in the upper right corner. 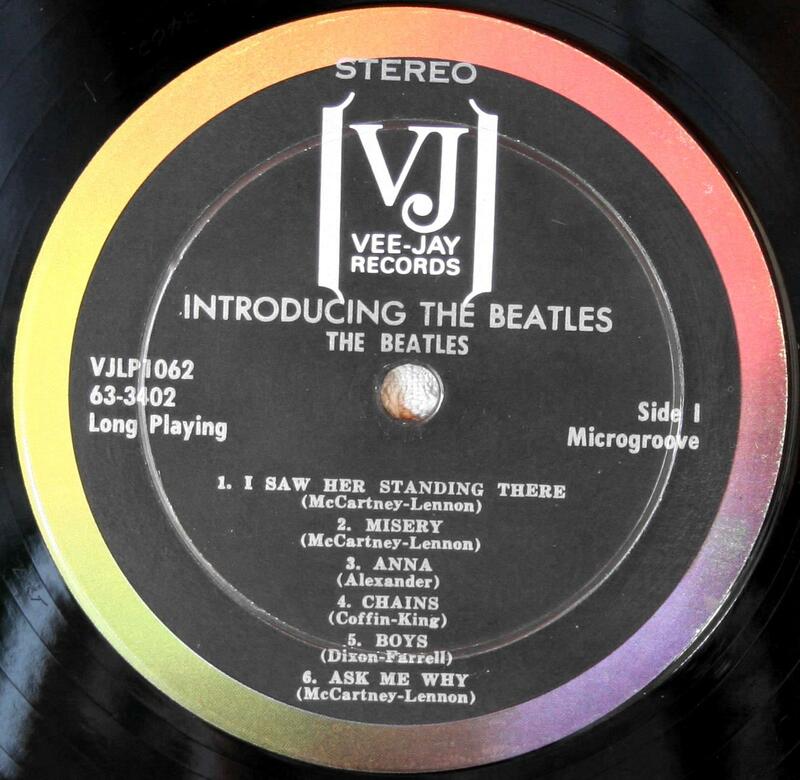 As with all Vee-Jay Beatles released, collectors are treated and /or tormented with several mono and stereo record label variations. First mono record variation has a black label featuring an oval logo with an outer rim colorband and left justified artist-only credits. Its trail off areas include the following hand etched markings: the matrix number 64-3852 on Side 1 and 64-3853 on Side 2; the job number 6295 on Side 1 and 6295X on Side 2; and the date 1-18-64 and “URJ” on both sides. Both sides also contain the machine stamped MR and Audio Matrix logos. This variation was pressed by Monarch Records in California. Second mono record variation has a black label featuring a large white brackets logo with an outer rim colorband. There are two variations of this label. With centered artist and songwriter credits and with “Long Playing” and “Microgroove” on the label. The matrix number, the date 1-18-64 and “URJ” are hand etched in the trail off areas, which also contain the Audio Matrix stamp logo. This variation was pressed by ARP in Owosso, Michigan. And with left justified artist-only credits without “Long Plying” and “Microgroove”on the label. Its trail off areas include the following hand etched markings: the matrix number 64-3852 on Side 1 and 64-3853 on Side 2; the job number 6295 on Side 1 and 6295X on Side 2; and the date 1-18-64 and “URJ” on both sides. Both sides also contain the machine stamped Audio Matrix logo. MR logo is scratched so that it can not be read. This record was pressed from metal parts that were previously used by Monarch Records. Trird mono record variation has an all black label with silver print and the large VJ logo with left justified artist-only credits. Its trail off areas include the following hand etched markings: the matrix number 64-3852 on Side 1 and 64-3853 on Side 2; the job number 6295 on Side 1 and 6295X on Side 2; and the date 1-18-64 and “URJ” on both sides. Both sides also contain the machine stamped Audio Matrix logo. MR logo is scratched so that it can not be read. This record was pressed from metal parts that were previously used by Monarch Records. 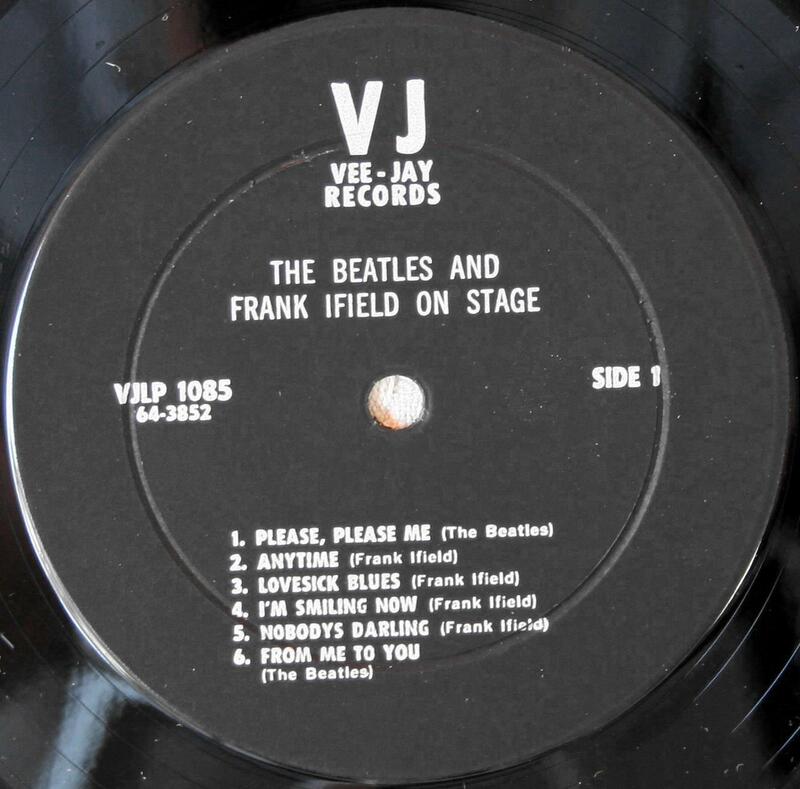 First stereo record variation has a black label featuring an oval logo with an outer rim colorband and left justified artist-only credits, the album number VJLPS 1085 and “STEREO” at 3 o’clock. Its trail off areas include the following hand etched markings: the matrix number 64-3852S on SIDE 1 and 64-3853S on SIDE 2; the job number 6298 on SIDE 1 and 6298X on SIDE 2; and the date 1-21-64 on SIDE 1 and 1-26-64 on SIDE 2; and the initials “RA” on both sides. Both sides also contain the machine stamped MR and Audio Matrix logos. This record was pressed by Monarch Records. Second stereo record variation has a black label featuring a large white brackets logo with an outer rim colorband. There are two variations of this label. With centered artist and songwriter credits and with “Long Playing” and “Microgroove” and with “STEREO” at 12 o’clock on the label. The matrix number and “RA” are hand etched in the trail off areas, which also contain the Audio Matrix stamp logo. This variation was pressed by ARP in Owosso, Michigan. And with left justified artist-only credits without “Long Plying” and “Microgroove” and with “STEREO” at 3 o’clock. on the label. Its trail off areas include the following hand etched markings: the matrix number 64-3852-S on SIDE 1 and 64-3853-S on SIDE 2; the job number 6298 on SIDE 1 and 6298X on SIDE 2. Both sides have a faint hand etched “RA” and the machine stamped MR logo. MR logo is scratched so that it can not be read. This record was pressed by Monarch Records. Trird stereo record variation has an all black label with silver print and the large VJ logo with left justified artist-only credits and “STEREO” centered above the album number at 9 o’clock. Its trail off areas include the following hand etched markings: the matrix number 64-3852-S on and 64-3853S SIDE 1 and 64-3853-S on SIDE 2; the job number 6298 on SIDE 1 and 6298X on SIDE 2. Both sides have a faint hand etched “RA” and the MR logo is scratched over. This record was pressed by Monarch Records.